True believers don't plan to depart from the Lord — they just fail to prepare their hearts before temptation comes suddenly upon them. Be prepared for the storms of life by learning how David prepared his heart in advance for adversity. The Lord gives us a promise in Psalm 10:17 that He will prepare the hearts of the humble. Therefore, humility is a key principle in preparing our hearts, and this teaching presents it in a most unusual way. Other key principles include renewing our minds, choosing what to think about ourselves, and using our God-given memory system to think on the right things. Learn what the Bible says about setting our affections and how to do it. If you aren’t “preparing,” then plan on “repairing.” This is especially true when it comes to the consequences of an unprepared heart. Christians are often found picking up the pieces of their lives after a storm they weren’t expecting. However, it does not have to be that way. 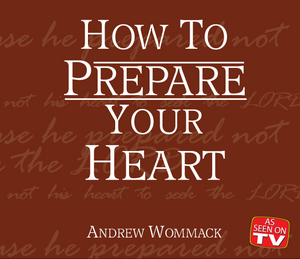 It’s time to learn how to prepare your heart. David, a man after God’s own heart (1 Sam. 13:14), prepared his heart in advance for adversity; his heart was unwaveringly fixed on God. Listen as Andrew explains how you, like David, can so fix your heart on God that storms have no effect. Imagination is often ignored by Christians because of its misuse. Satan certainly understands the power of our God-given imagination, and tries to pervert it for his purposes and our destruction. However, if used properly, it plays an important role in the preparation of the heart. Learn how.